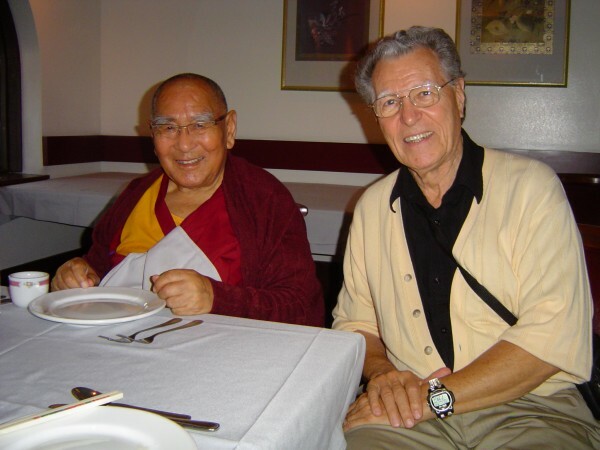 Geshe Lhundub Sopa Rinpoche with George Propps. Photo courtesy of George Propps. I first met Geshe Sopa in November 1974. I was new to Buddhism and had very little knowledge of the subject. What I had learned was from a book on Buddhism and a public lecture by Lama Yeshe and Lama Zopa Rinpoche. Geshe Sopa was leading a weekend retreat in the hills of southern Indiana. I attended just to see what Buddhism was all about, but I got more than I bargained for. I was very taken with Geshe Sopa; he really impressed me. I could not get over the fact that he did not sleep during the night. His bedroom light was on all night and then went out around 5:00 a.m. every morning. Seeing this was very new to me. After this lam-rim retreat was over, I asked Geshe Sopa if I could come up from Indianapolis, Indiana, to Madison, Wisconsin, to visit him some time, and he answered, “We will see.” Two months later, I received a letter from him. In it he stated that his spring vacation from the University of Wisconsin was coming up in March and asked if I would like to come up and stay with him that week and that it would be good to do. I checked my schedule and sent him a letter that I would. Geshe-la was renting a small three-bedroom house in Madison near the university. He had one bedroom; Geshe-la’s friend and assistant Elvin had another bedroom; and John Newman, one of Geshe-la’s students, was staying in the basement. The third bedroom was made ready for me. It had new bedding and towels. The room had just been painted and it was spotless. I knew that Geshe-la had been part of the painting crew because he still had a spot of paint on his arm. For that whole week – morning, noon and night – it was Geshe-la teaching me Lam-Rim Chenmo. I was on a cushion on the floor and Geshe-la was seated on his bed. At the time, I had no idea what was happening. It was just a great experience for me. Even today, I still don’t know why he did that for me. It was an incredible experience to be taught the Lam-Rim Chenmo by a living buddha. Over the years we became very close. He would come down to Indianapolis to visit me during his summer vacation, and later, after my family moved to Florida, he would come to Florida to visit during the winter. Geshe-la loves the warm weather. During one of his winter visits, Geshe-la asked me to start a Dharma center in Ft. Myers. His request scared me to death. I told him that I could never do that because I was the dumbest person he could ever get to run a Dharma center. I was able to put it off that year, but he kept after me until I finally said yes. He said that I should keep it simple and when I had questions, that I should call him. I was so frightened of saying something that was not true that just about every week I was on the phone to Geshe-la who used to laugh at me for being so concerned. And after awhile, I had learned more Dharma than anyone that came to his normal Dharma group. He named our group Ganden ChoJor, after his first monastery in Tibet. Several of the group became good students and have visited Geshe-la at Deer Park, Geshe-la’s monastery just outside Madison. A couple of times Ganden ChoJor would set up a conference call with Geshe-la. He would be on the phone at Deer Park and the other end of the line would be the group in Ft. Myers with the speakerphone. People in the group would have a question and answer session with Geshe-la, which was very exciting for everyone. For around 12 years, I was Deer Park’s treasurer. During that time, Geshe-la built a new temple at Deer Park and as with most building projects, the budget got out of hand and costs soared. I was very worried about this and kept telling Geshe-la that we needed to cut back. Every time, Geshe-la would tell me not to worry about this and that everything would be OK. And as always, Geshe-la was right. A group of very kind and compassionate benefactors came to our rescue. One year, Geshe-la and I went on a teaching tour of California. He was the teacher and I was his driver. We went to San Francisco and then down to Land of Medicine Buddha. While we were there, Geshe Lobsang Donyo, a student of Geshe-la’s, came to visit. I decided to make them a cup of Tibetan butter tea, a very strong black tea with butter and salt. I served it to them and they both, politely, drank it down. I asked if they would like another cup, but they both said no thanks. I asked if the tea was OK and both of them said, very loudly, that it was terrible and the worse tea they had ever tasted. Even today, Geshe-la will remind me never to make Tibetan tea. One year we were in Miami, Florida, visiting George C., another student of Geshe-la. George had set up some teachings for Geshe-la in another person’s house. This was to be a public talk and prior to the teachings, several people asked me what Geshe-la would be speaking about. I told them that I had no idea. Each person said that they would like to hear about a certain subject to help them understand some aspect of the Dharma. I did not tell Geshe-la their requests, but, as I knew it would, his talk included all they had requested. Many times Geshe-la did this very thing. He always seems to know what others want to hear. During one of Geshe-la’s visits to Ft. Myers, we decided to go to lunch at a resort on Sanibel Island. This was a very posh restaurant, overlooking the Gulf. When we were finished eating, someone who had recognized Geshe-la sent over to our table a piece of Key lime pie and a piece of chocolate cake. We decided to split each piece so that we could try both. I split it so that Geshe-la got the biggest pieces, but when Geshe-la saw what I was doing he said, “No, no, no. The big pieces are for you.” And he took the smaller pieces instead. As we were fighting over them, we heard the waiter telling the people at the next table, “Why don’t you have the chocolate cake? Look how much fun they are having with theirs!” Needless to say, that broke it up and we laughed all day about it. Geshe-la has been my teacher for 38 years. He is my teacher, my protector and my friend. He is a living buddha, the one to whom I go for refuge. He has great knowledge on how to benefit all sentient beings. He is a compassionate, caring bodhisattva with a great sense of humor. He is generous, patient, ethical and has great perseverance. He is a meditator and fully understands the wisdom of emptiness. From the bottom of my heart, I can only say that Geshe Sopa Rinpoche means everything in the world to me.